On Friday night, Kinsey, her boyfriend, Lloyd Harvey, and about 150 other people gathered in front of the Dallas Police Department for a vigil honoring the man Kinsey knew as Bo, her neighbor at the South Side Flats apartments across the street. Kinsey and Harvey were at home when they heard the shots that ended his life. On Thursday night around 10 p.m., an off-duty Dallas police officer shot and killed the 26-year-old man after the officer attempted to enter his apartment, believing it to be her own, according to statements from DPD. The as-yet-unnamed officer was just coming off a shift and was still in uniform, DPD says. Neighbors say they heard two gunshots, and little else. Jean was taken to Baylor University Medical Center, where he later died. The incident was initially handled as an officer-involved shooting, which meant police questioned the officer and took a blood sample but did not take her into custody, and she was placed on paid administrative leave pending an investigation. On Friday afternoon, Dallas Police Chief U. Renee Hall requested a manslaughter warrant for the officer. As of Friday night, the cop has not been named, nor has she been taken into police custody. The Texas Rangers are conducting an independent investigation. 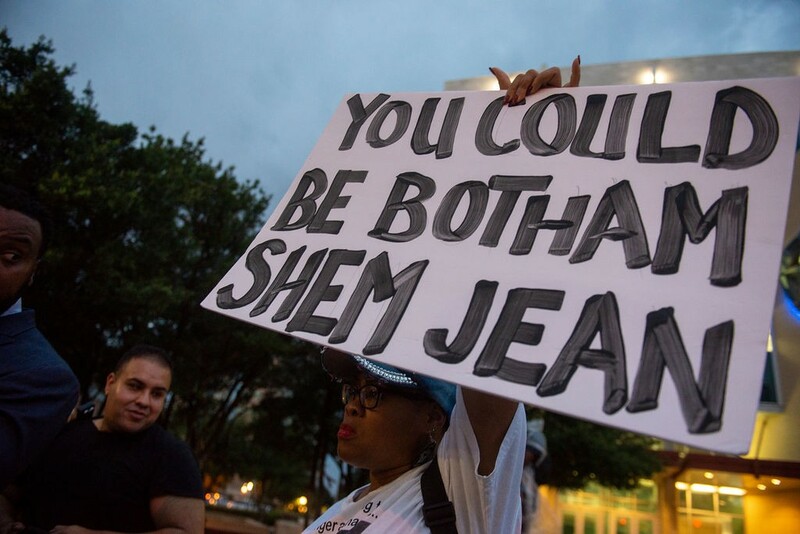 As the heavy thunderstorm receded on Friday night, a diverse group of people — ample media outlets in the wings — memorialized Jean at the vigil, organized by local activist group Mothers Against Police Brutality. Throughout the peaceful gathering, between memories of Jean shared by parishioners from Dallas West Church of Christ, where Jean was a youth group leader, activists called for the arrest of the officer who shot him. At a Friday afternoon press conference, Chief Hall said she was uncertain of the officer’s whereabouts and that her name won’t be released until she’s officially charged. Young King Solomon Grayson runs in front of a makeshift memorial for Jean in front of DPD headquarters. Jean, a native of St. Lucia, worked at the Dallas office of PwC, a consulting and tax service firm. His friends and neighbors described him repeatedly as a kind, studious Christian. “He was a really great guy — like, always the nicest guy,” Harvey said of his neighbor, the only neighbor who offered to help two strangers, Harvey and Kinsey, move into their building. People held up signs throughout the vigil: “Where is justice when police kill us?” “End police brutality,” “Disarm off duty police.” Activists and religious leaders called for expanded power for the Dallas Citizens Police Review Board, for the arrest of the police officer and for change in DPD’s policing. If there were DPD officers at the vigil, they did not make their presence known. “We need to push past our initial grief,” said Dr. Michael W. Waters, pastor of Joy Tabernacle African Methodist Episcopal Church in Dallas. “As hours turn to days, as days turn to weeks, as weeks turn to months, sometimes you go back to the status quo to live in our lives as usual, and we never really push open the doors of justice in this nation. Sue the American Government for allowing their police all over America to murder black people.